These are the books recommended for your P5 child to prepare them for both Paper 1 & 2 with common PSLE exam questions and a good start for revision. And beneficial for parents who are coaching their child at home. Purchase this product now and earn 842 Points! We have compiled the books together which are recommended for Primary 5 to help your child reinforce the concepts learnt from their previous levels and to help gear them up with the essential skills & strategies for both Paper 1 & 2 in PSLE. As much as learning & understanding the problem sums concepts is important, so does revision, which is the key for doing well in exams. These books highlight on the Concepts-Processes-Skills (CPS) method to help students solve problem sums easily & independently as well as consist of questions with detailed solutions that are commonly tested in PSLE Math Paper 1 & 2. Our Problem Sums Guide books contains the 12 types of concepts that your child needs to know by P6 and they provide a very clear step-by-step approach to solve the questions and it makes learning & understanding easier. 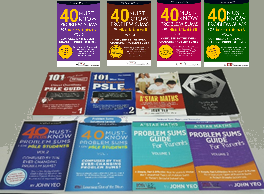 Our 40 Must-Know Problem Sums books is for Paper 2 & 101 Direct Must-Know Questions books is for Paper 1, and they contain the most popular & common questions from previous PSLE Math papers.